A Moment in Time Can Change Everything. In a blink of an eye, a sweep of a second; if one change in your life unknowingly gave you a second chance, a do-over… Would You Take It? Many people say they can recall a time in their life when something changed for better or worse. Maybe it was an unexpected event, a thought, a decision or an action they took. For Debbra, she knew exactly when that happened. It was the day she hit the wall; literally. 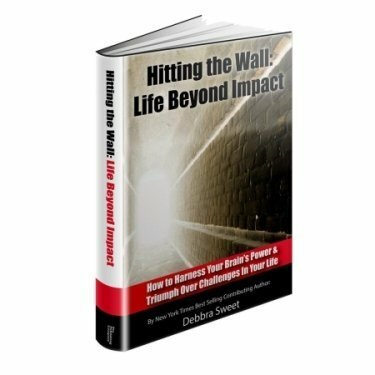 “Hitting the Wall: Life Beyond Impact” is based on her real life story. Emotionally captivating and profoundly heart wrenching, learn how unknowingly living with a severe traumatic brain injury (SBTI) actually saved Debbra’s life. An extraordinary 30 year quest for answers on ‘what changed that day’ opened doors to an experiential enlightenment of the inherent ability for the body to be completely healed and how we learn. Living through 3 periods of time (a total of 7 years) where Debbra lost the ability to walk, talk, learn, remember is the foundation of what she teaches, talks and writes about. Debbra’s experience gave her insights into how to harness the power of your brain in order to unleash your human potential and triumph over every situation. Her experience is unique and she has insights rarely able to be shared by those who endured SBTI. The revelations shared within Debbra’s forthcoming book and her inspirational speaking on this subject will support those who are living with SBTI, or are ‘normal’ brained. Her insights and practical solutions can be applied professionally and personally. Big or small, young or older, you will be filled with inspiration, hope and practical steps empowering you to come out strong to triumph over obstacles and achieve your goals. Everyone faces life obstacles. They may be small or large. Sometimes obstacles can overwhelm you. How do you get out from underneath them, get beyond them and turn what at first, might look like as a negative situation, into a positive out come that makes you smarter, stronger, have more wisdom, strength and perspective to endure – and avoid situations like that again? This inspirational presentation is based on a real life story that shares a revealing look at a tragedy to triumph situation. In one swift movement, a young girls life changed. That moment not only affected her life- but those around her. Her sharing is not about focusing on the event itself. It’s about sharing the insights gained on how the brain works-= and how you can harness the power of human potential to triumph over anything, anytime, anywhere. Watching you go through all your rehabilitation, doctor appointments, and being very focused on your recovery was a great inspiration to me. There were days when I was going through rough personal matters, but watching what you had to overcome really put things into perspective for me. You are so strong, and you didn’t even realize along the way how you inspired me. I even went back to church and started to pray again as you really showed me that every thing can be worked through for us to come out even better. Thank you for your courage. It helped me have courage to do the same for my life and circumstances. I hope you share your story. It’s so inspirational! There are many people who will benefit from what you have to share and offer from your experience. Please let me know when your book “Hitting the Wall: Life Beyond Impact” is done. I want to be sure to read it. Hearing you talk about your severe traumatic brain injury for just a bit is incredible! There are many people who could use motivation and inspiration, and your real life story has both. Glad for your triumphant return! You are so strong! To stay so dedicated and disciplined to overcome your brain injury is inspiring. If it were me going through that, I think I might have given up a long time ago. To hear you talk about this injury, and how you are relearning how to do everything again is humbling and motivating! Thank you for sharing your story. I can’t imagine what you are going through Debbra! Your such an amazing woman! You are an inspiration. Keep on keeping on! Gigi and are pulling for you, Debbra. We’re your biggest fans! Happy New Year!